Hideaway Farm cottage in walking distance of Coast Path & Manorbier Village. 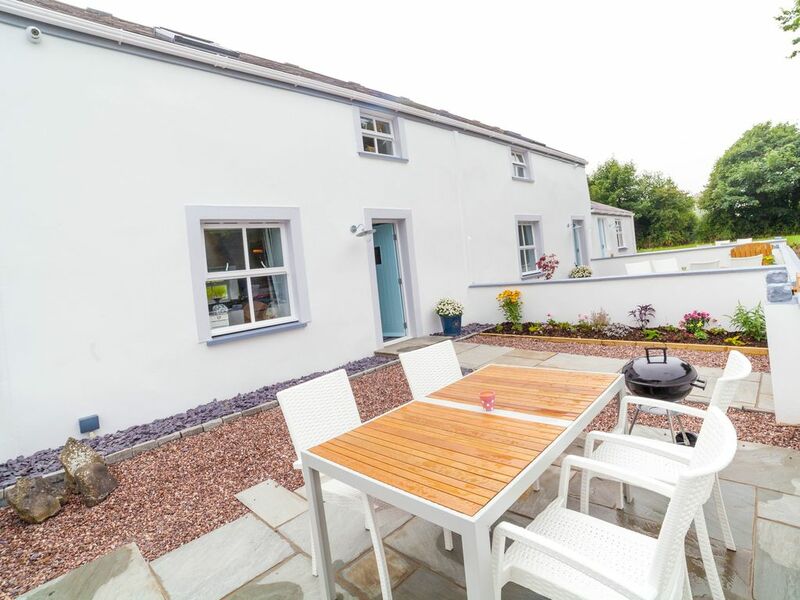 Preseli cottage is set in 10 acres of rolling grounds which have wonderful sea views of both Manorbier and Skrinkle bay. A short walk through the meadow will bring you within a stones throw of the village of Manorbier where you can find an excellent shop, handy post office, relaxed pub and delightful tea rooms including a beautiful seaside gift shop. Manorbier is a village with a wealth history, also featuring a beautiful castle with spectacular views of the bay, a picturesque church and not forgetting the stunning, secluded beach with parking in walking distance. The cottage itself is named after the rugged Pembrokeshire mountains - The Preselis. It encaptures the spirit of the Preselis, with a beautiful slate wall, locally sourced art and decorations. It is a centrally heated 2 bedroom barn conversion with an open plan lounge, kitchen and dining area. There is an enclosed, gated, beautiful garden with patio, furniture and barbeque to the front of the property. Entrance is into a welcoming hallway with a door leading off to the lounge and kitchen. The newly fitted kitchen is well equipped with electric oven and hob, fridge/freezer, microwave and slim line dishwasher. A cosy lounge with TV (freeview) and DVD has views out onto the garden area. Two double bedrooms one with double bed and one with an adult size bunk bed, all with excellent quality bed linen provided and made up for your arrival. The Family bathroom has an elegant drench shower, toilet, sink and heated towel rail. The whole cottage has been thoughtfully redecorated and designed this year (2018) to create an idyllic hideaway. Wonderful location and superb accommodation. Llinos was a great host and made us feel very welcome. Wouldn’t hesitate to stay again. We had a really lovely couple of days, helped by some gorgeous weather. However, even if this hadn’t been the case the cottage would have more than sufficed. It has been renovated to a really high standard, is in an excellent location and was a real home from home. The welcome hamper was a lovely touch, and Llinos was a warm and friendly host. Beds and bed linen were to die for! We would have no hesitation in returning and recommending to friends and family. Thank you for such a great review, brilliant to hear that the cottage met all of your expectations. We have just enjoyed a very relaxing stay in Preselli cottage. We can fully recommend the accommodation, it is full equipped to an excellent standard plus cosy and warm. Photographs accurately depict the rooms and the quality of the fixtures and fittings. Nice little ‘extras’ (hand picked games and books) left by the owner give a personal touch, which is very much appreciated. Location is great too. We walked to beach at Manorbier which is fab, explored Lydstep Head and beach (126 steps and a clamber over rocks to the beach, but worth it) - exhilarating, and wandered around Tenby. Eating out, we had great food at Beach Break Tearooms, Manorbier and Tudor Lodge, Jameston. Highly recommend accommodation and area. Thank you so much for such a lovely review Sarah, it's always so nice to hear that the personal touches are appreciated. We love making sure our guests enjoy their stay! Llinos & Russell, are excellent hosts and have created a wonderful cottage that is better than home! The whole cottage is fitted out to a very high standard and we had a fantastic weekend there. The location was perfect for us with loads of walking options down to the beach, along the coast and into Manorbier. It is also an ideal location for visiting the many castles in the area but check dates they open as many are closed in February. Tenby & Pembroke are well worth a visit. Thank you so much for your lovely review Helen, we so enjoyed having you to stay and hope you'll visit again soon. Please note that changeover days are only Monday or Friday out of peak season.